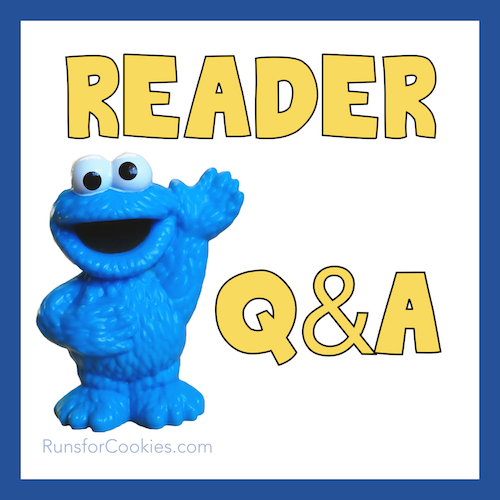 On Sundays, I will answer some readers' questions in a post. If you have a question that you would like me to answer here on the blog, just send me an e-mail with the subject "Q&A", and I may include them in a future Q&A post. They don't have to be about weight loss or running--anything is game! (Remember, I'm not a doctor or dietician, or any sort of medical professional--I can only answer questions from my own experience). Q. Did you talk about your weight loss as you were doing it? I feel so self conscious telling my friends I'm dieting! It's like admitting I'm fat (not that they can't tell...). A. I was embarrassed to tell people at first--not because I was afraid to admit I was fat (I knew that was obvious)--but because I was afraid of failure. I had tried to lose weight so many times before only to gain it all back, so I "knew" that it wasn't going to last. I just wanted to save myself the humiliation. Actually, that was one of the reasons I started this blog. I wanted there to be people I had to be accountable to, whether I was losing weight, maintaining weight, or even gaining the weight back. Knowing that I will have to admit my weight on my blog helps keep me in check (sometimes--it doesn't always work!). But anyway, you don't have to get specific with your friends about what you're doing--just maybe tell them that you're making healthier choices to try and lose a few pounds. They don't need to know the details. 50 pounds down--people FINALLY started to notice! A. I wish I had experience with all of the Garmin models so that I could recommend a specific one. The only ones I've used are the 205, the 305 and now the 910XT. I don't believe that Garmin makes the 205 and 305 anymore. The 910XT is awesome, and has all the bells and whistles--but if you're not a triathlete (*cough* ME *cough*), then you'll be paying for features you won't use. There is a great blog that has a review of all of the watches, and it can definitely help you make a decision! You can find it here: DC Rainmaker Product Reviews. That said, I definitely recommend getting one that includes a heart rate monitor (some models don't). Even if you don't think you'll use it, you may change your mind later (as I did) and wish you had it. Q. Do you know of anyone through your channels who lost weight, became a runner with ASTHMA? I find it hard to find runners with asthma. I am looking for tips for starting a running plan from someone with asthma. A. This is a question that I actually cannot answer, because I don't know anyone with asthma who has become a runner (at least that I know of). But I wanted to post this in case any of my readers have dealt with it and may be able to offer some encouragement...? Hello! I am a 23 year old runner with asthma. My advice is: you can follow the exact same running plans as everyone else, but ALWAYS bring your inhaler. I take a couple puffs from it on almost every run, usually in the first two miles. Sometimes I pause for a second until I'm breathing better. Don't hesitate to use it, and remember to keep calm and give it a few seconds to kick in! Most importantly, always have your ID and cell on you in case of a real emergency. This will be especially helpful for your peace of mind, even if you never need to use them. Eventually you'll learn how your body reacts to running and know how to handle your asthma. There's no need to let it hold you back though - I just ran my first half marathon! Hope this helps and good luck! Good advice! I have seasonal/allergy related asthma and that is what I have done when exercising in any way. There is also a Spin instructor at the gym who always takes a dose of her inhaler while she's setting up her bike and again after the warm-up. I really needed to hear your response to how long it took for people to notice your weight loss. I have lost 18 pounds so far and see very little difference. Most of the difference is in my legs from running 3 times a week. However, I workout 6 days a week and have been feeling very frustrated the past few days from the lack of physical evidence. I know that because I have so much extra weight it is going to take a lot more to see a difference but it has just been frustrating. I am still sticking with my workouts and have stayed within my calories. Your response tonight was just the boost I needed. Thanks. I didn't do this, (wish I had!! ), but maybe you should measure yourself. You may not be able to see that you've lost an 1/8" in your calves or 1/2" in your waist, but the tape measure can be very positive feedback. The naked eye may not notice the difference, but the tape will. And take lots of pictures like Katie did! I wish I had! I have been reading your blog for a few months now, and I love hearing what you have to say. I have struggled for years with weight and just can't seem to find the motivation to stick with any type of plan. I recently started running and doing some strength training, and have found some people to hold me accountable. It is working so far, but I love reading your blog and responses! It definitely helps to know there are other people that struggle with some of the same things! ALTHOUGH, I will add that you should talk to your doctor that monitor's your asthma and asthma medications BEFORE starting any exercise routine. They can help you figure out how, what, and when to use your medicines & peak flow meter. I know my asthma pretty well, but when I started adding exercise to my lifestyle my asthma became worse. My doctor adjusted my fast acting meds and started me on a new daily med. I now have to take my fast acting med 15-30 minutes before exercise or being exposed to known triggers. I can have just an active lifestyle as anyone without asthma as long as I follow my asthma action plan that was developed for me by my doctor. Katie, you have inspired me (and so many others) from day one, but when I read your Sunday Q&As, I'm reminded more than ever why you have such a loyal following. Thanks for always being so REAL and supportive, caring and helpful to your readers. You make us feel like we are not alone! Thank you a million times over. My son has asthma and is one of the fastest runners at his school! I think, as the others have said, bring your inhaler along with you just in case (my son carries it with him always), but so long as you listen to your body there's no reason you can't start running! I totally understand what you said about not telling anyone about your weight-loss efforts. I was afraid of all the "internal eye-rolling" everyone would do, like, "Oh, here she goes again." But, I did it for me, not everyone else. The compliments are just icing on the cake. "Mmmmm....cake...."
I have the Garmin 405 GPS watch...I love it...it is one of the less expensive one, it does come with a heart rate monitor, I didn't get it but wish I did, it does not vibrate like Katie's, but I can hear the beep every mile, if I don't have my music too loud or if a loud car isn't going by. I absolutely love it. It has quite a few feature that I don't use, as I am new to running and I just use it to keep track of my pace and distance. My sister has the same one and has used the feature that you can race against yourself, can't think of what it is called, but she is working on her speed so she likes to try and do better than previous runs. I've lost 33 lbs, so far, at about 30 is when people, I see all the time started noticing, family, coworkers...it is frustrating to be working so hard and to see them numbers go down on the scale but not really notice a change...my friend and trainer tells me "slow and steady wins the race" when I get frustrated...that's why I'm getting a turtle pandora charm for my goal of getting under 200 lbs...I'm getting it tomorrow...I've been under 200 for 2 weeks, I think it has stuck. I can totally relate to the first question - for some reason admitting I was losing weight was like "coming out" as fat or something. It's been a process, but I'm really comfortable now...which is why I also started the blog. Obviously after losing almost 80 pounds EVERYONE notices, so I was kind of forced to open up about it and I was pleasantly surprised how supportive everyone in my life has been. I have asthma and I run. When I started running, my asthma was pretty bad -- I actually didn't know I had it, but I hated running because I could never breathe. Finally, after years of having colds that kept me from being able to breathe for months at a time, my doctor put me on albuterol and pulmicort. The pulmicort is a steroid inhaler, and it is AWESOME. I initially took it twice daily, and used the albuterol whenever I exercised -- now, I just take pulmicort once a day, and keep the albuterol for emergencies only (I hated how jittery it made me). I know this sounds like a drug pitch, but here's the bottom line: drugs helped me be able to run, and running helped my lungs get sooo much stronger. I can't describe how great it is to be able to run without wheezing, which was definitely the #1 reason I didn't like to exercise around people. I do still run/walk -- even though my legs might be able to keep going, I know I have to make accommodations for what my lungs can handle. So I'll probably never be a sprinter, but I love long runs, and I love how well I can breathe because of running. 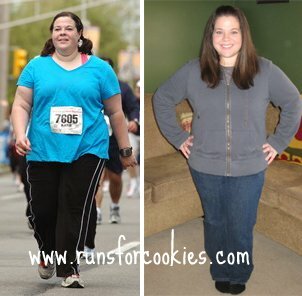 I've lost almost 70 lbs and discovered that I still have asthma (although only when exercising) when I started running. After some scary episodes and some testing, I was prescribed an albuterol inhaler that I use 15 minutes before I go out. It makes a lot of difference!!! The first time I used it, I went from running a mile and gasping for air to 3 miles feeling great (except that was too big of a mileage jump for me and I developed a knee problem grrr). I also thought I would mention that I was a SMOKER until January and I decided to quit so I could run (all of my previous attempts had failed because I couldn't breathe). Once my lungs had cleaned out of the nastiness, it was better, but I STILL had trouble, and that's when I got a Dr's opinion. I've been running 30 years now (I'm 45 now).... had asthma as a kid but "out grew it" when I was 12. It returned when I turned 30.... but I'm still running ! See your MD for sure .... for your options. For me, I run with my inhaler in my pack just in case. I think I've used it 5 or 6 times in the last 15 years and it's always when I finish. Never have had any isses while running. They have come light years in terms of research and drugs since I was a kid and I know lots of folks who are very physically active with asthma .... check out your options for sure! I really enjoy reading your blog, and how you detail your journey. I love your honesty and your sincerity. Keep at it! You're very encouraging. Like you Katie, no one but my immediate family had a clue that I was trying to lose weight. I was afraid of failure too, for that very reason I never ask people who announce they are dieting how much weight they've lost a few months down the road for fear they have fallen off the wagon as I often did. I see no reason to humiliate people. Nobody noticed my weight loss until the day I wore my new size 24 jeans to work. Gosh I thought I was svelte, but looking at the pictures from then (2 years ago this summer) I see I had a long ways to go. But I had lost close to 100 lbs at that point before anyone noticed! You see how far I had to go. I do think the thought of people talking about my weight gain keeps me on the straight and narrow. That would just be too humiliating so I work hard to make sure there's no discernible weight gain to talk about. I had bad asthma as a child, and I have been an athlete all of my life. Making running improvements has always been a struggle and it seems like if I stop running for more than a day I am back at square one. Asthma is a constriction of the airways from irritation and a TON of things irritate it. Including intense respiratory exercise. A few things that help me a ton is a PROPER WARM UP. Warming up vasodialates arteries and airways by getting the blood flowing. That means makes the vessels stretch out. Which makes it easier to take in air. Some people might feel it if they normally warm up and for some reason don't. The first ten minutes of exercise is awful. Also, asthma attacks are 20% irritation and constricted airways and 80% hyperventilation from panic. I am a division one athlete and have been caught without my inhaler a few times. The breathe gets tight, you start to get tunnel vision... but my doctor told me to just close my eyes and focus on relaxing and breathing in through my nose instead of my mouth. I sometimes have to repeat to myself "I'm okay" over and over to keep from panicking. It usually clears right up, and my airways feel sore for the rest of the day. If that doesn't help and you don't have an inhaler definitely seek medical attention. Last tip is that you need to make goals and don't push yourself beyond your point. Some people think mind over matter during running but jumping from 2 miles to 6, or cutting rest time because you feel okay about it, isn't smart with asthma. Your body needs the small adjustments. It isn't impossible to be a runner with asthma. Hell, I played soccer for a few years. That was a rough one!